Our cottage St Léon duplex, "classified 3 stars", welcomes you throughout the year with a capacity of 2 to 3 people. With an area of ​​55m2, it is bright and ideally located in the heart of our charming little town of Eguisheim. Our apartment is composed of a living room with a flat screen TV, a kitchen: (dishwasher, oven, microwave, freezer, filter coffee machine, raclette part). Upstairs: A large room with a bed 2 persons (140 / 200cm) with new bedding of 2019 for your comfort and a single bed (90 / 200cm), a TV with DVD player, a bathroom with shower and toilet. Warm atmosphere and soft colors. It is located on a small pedestrian square, in the shadow of the castle St-Léon is quiet. Eguisheim "elected the favorite village of the French" is 5 km from Colmar. Bakery, butcher, caterer, grocery-tobacco-press and many restaurants are close to our rental. Parking at the foot of the duplex to easily drop your luggage. Parking planned on public site in our city. Possibility to request parking your vehicle privately in the yard of our friend winemaker or public parking fee € 3 per day. You will love the quiet and peaceful atmosphere of our duplex overlooking the three dungeons of Eguisheim. We provide free high chair, bath and cot on request. The beds are ready for your arrival, bath towels are provided and the end-of-stay cleaning is included in our price. Garage for bike or motorcycle available on request. Non smoking apartment. Eguisheim, one of the most beautiful villages in France, is a place where friendship, hospitality, joie de vivre, respect for one's roots and the openness of others are cultivated. This is the originality of this beautiful city and its attachment to those who live there or who visit. Its discovery is never complete since it changes over the four seasons, each time presenting a different aspect. Eguisheim, magical village, wants to remain this commune that we visit but also this land where we come back. Fortified city since 1257, Eguisheim is proud of its picturesque concentric streets with half-timbered houses richly flowered (Cité classified 4 flowers - Grand Prix National, since 1989 and gold medal in the contest of the European flower arrangement in 2006). Sixteen cours colongères, fountains, the parish church houses a polychrome wood sculpture called 'Virgin Opening'. This work of the 13th and 14th centuries is the only example of this type in Alsace. The lower castle of Eguisheim, in the Place Saint-Léon, is backed by an octagonal enclosure characteristic of the 13th century, made of stones with bosses. Thick by more than 2 meters in places, this wall was surrounded by water ditches, drained in 1835. The castle is accessible only as part of the guided tours offered by the tourist office. Alsace is not a little proud! It has recently a new distinction as gratifying as its landscapes are beautiful and flowery villages. On France Télévisions channels, Eguisheim became the favorite village of the French in 2013. Everyone who has already walked the cobbled streets of Eguisheim can testify to the charm that operates there but it is not without surprise that Eguisheim has supplanted all the villages in the running in this friendly competition presented by the famous Stéphane Bern. Located on the Alsace Wine Route, very close to Colmar, Eguisheim nestles on the green hillside of the Vosges. Surrounded by vineyards, the viticultural village is ranked among the Most Beautiful Villages of France! It is good to walk in the shade of its streets that unfurl around its castle. Half-timbered houses, fountains, flower beds, everything seems to have been designed to give the medieval city a charm of postcard that can only be found here in Alsace! As is traditional in Alsace, Eguisheim is remarkably flourishing. This has also earned him several honors, such as the Gold Medal of the European Flower Arrangement or the Grand Prix National du Fleurissement. Its richness comes from a unique architectural ensemble, preserved from the ravages of history and intelligently preserved in its medieval enclosures still intact, but which would be nothing without the charm of a geranium hanging on a balcony, a smile on the pace of door of a typical restaurant or an inimitable Alsatian accent that will tell you about the wines of Alsace produced in Eguisheim ... the favorite village of the French! 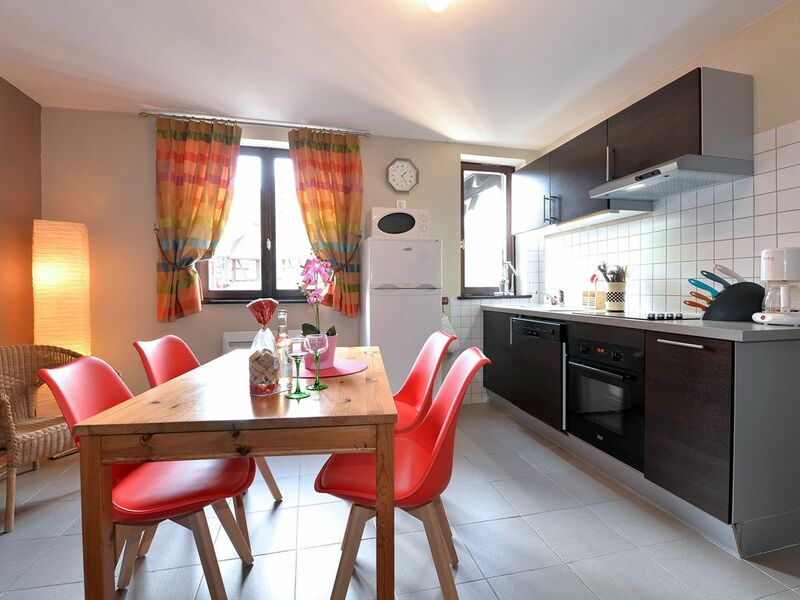 Gite Geranium 90m2 composed of 2 bedrooms, living room, kitchen, garage. Gite Edelweiss composed of 3 bedrooms, living room, kitchen, terrace and garage. Our three apartments are located in Eguisheim. With a large shower, WC, bath towels and linen. High chair, bath and cot available on request. Iron and ironing board, vacuum cleaner, broom, broom brush, bucket and mop available. Our 2013 novelty you a second house for 4 people completely renovated in March 2013 (ad No. 992868) HomeAway also visible. The house was a good base providing you don't mind climbing stairs, which were outside and inside the property. We found everything that we needed but the mattress on the bed was smaller than the metal base and my husband cut his leg twice. The owners were lovely and very helpful. Altogether we enjoyed ourselves very much. We spent a week in Eguisheim and loved it. While there are many places to visit, my wife and I agreed that this is the most enchanting. The apartment is small but well-equipped, quiet, and right in the center of the village. Just pop across the place in the morning for a fresh baguette! I would recommend this apartment. Know that there is a circular staircase up to the bedroom and bathroom, if you have any difficulty with stairs. Geweldig verblijf in Eguisheim. Voor die prijs heb je wel erg veel. Huisje bestaat uit 2 verdiepingen met beneden het woongedeelte. Het ontbreekt je echt aan niets. Zelfs een oven en vaatwasser zijn voorhanden. Eguisheim is al een trekpleister op zich. Voldoende mogelijkheden in de buurt om ff naartoe te fietsen. Van de kleinere dorpen tot een iets grotere stad, zoals Colmar. De eigenaren zijn vriendelijk en altijd bereid om je van informatie te voorzien. Persoonlijk lijkt het mij minder geschikt voor gezinnen met jongere kinderen. Al met al een aanrader !!!!! Séjour très agréable au coeur d'EGUISHEIM. Duplex agréable pour 2.5 personnes. Bien situé au cœur de la route des vins. 45 kms from Strasbourg, Basel and Freiburg, European capitals. Our rental is located in the center of the small town of Eguisheim. Eguisheim, birthplace of Alsatian vineyard 1590 inhabitants, ranked among one of the 'most beautiful villages in France', surrounded by prestigious vineyards of the largest wine cellars. Located at an altitude of 210 meters, on the wine road of Alsace near Colmar. Birthplace of Pope Saint Leo IX, Eguisheim enjoys a worldwide reputation. SINCE June 2013, EGUISHEIM ELU 'THE PREFERRED FRENCH VILLAGE' ON FRANCE 2. Other Activities: beautiful walks in the vineyards of Eguisheim.